Tom Harding, of Westport, competes in the 10k Minuteman Road Race at Compo Beach in Westport on Sunday, May 2, 2010. It's become one of the best running weekends of the year in Connecticut -- hot weather (sometimes a little too hot! ), scenic courses and a perfectly run event. 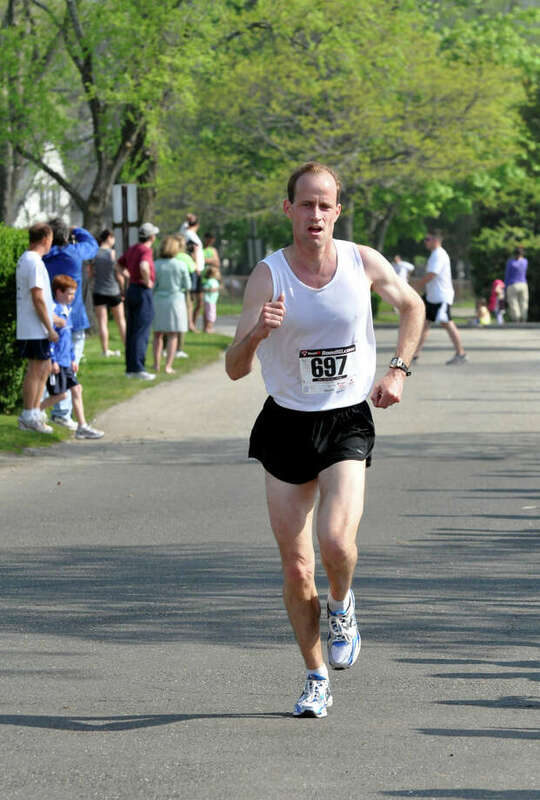 The Stratton Faxon Fairfield Half Marathon and 5k will take place on June 22 and 23 at Jennings Beach in Fairfield with as much anticipation as ever. The half marathon is expected to reach its capacity of 4,500 runners very soon, and the 5k will most likely reach its max of 1,500. The half marathon will be celebrating its 33rd year on June 23, and the 5k will be kicking off for the 18th straight year. I registered for the half marathon last week and can't wait to see firsthand what so many runners continue to enjoy every June. I also picked a good year to give it my first try since the half marathon course has been altered to take away some hills and provide an even more scenic route along the coast. In order to learn a little more about the experience, I decided to talk with Westport resident Tom Harding, 47, who has run the half marathon every year except in 1999, when a broken rib forced Mr. Fairfield Half to stay on the sidelines. "I kind of regret not doing that year even with the injury," Harding said. "It would have been nice to keep the streak going." Harding, who grew up in Fairfield on South Benson Road (where the women's course passes by at the start), won the race in 1991 after a few frustrating second-place finishes. "I finished second more than anyone else," Harding said. "There was always somebody that could beat me. "It was always a challenging course for runners. I always give it my all -- but last year I crashed and burned while struggling with some injuries. This race has become so popular and a lot of people shoot to finish a half marathon or marathon." The running bug bit Harding when he was 11 years old, when he went to a track with a friend of his mother's for a run. "I ran around the track and just kept going," Harding said. "I did about three miles and realized I had some talent." Harding has been running ever since. He went on to run cross country and track at Ludlowe and earned a scholarship to Virginia Tech, where he studied finance and was a distance runner. Harding, who now works in the treasury department for Times Warner Cable, tries to run about 50 miles a week on a busy schedule. He and his wife, Michelle, have two sons -- Declan, 12, and Dillon, 9. Michelle also runs and has done the Fairfield half a few times, but she will miss this year's race due to an Achilles injury. "Your focus changes as you get older," Harding said. "When I was younger, I was a decent runner and thought I could get a scholarship. Then I thought I could make an Olympic team and run professionally. All just to continue running. Now I am just happy to be out there, stay fit and keep peace of mind. Nobody can bother you when you're running." Despite all the success Harding has had on the road, it's one of the "bad" moments that he remembers the most. "In 1994, I was in the best shape of my life and ready to run my first Boston Marathon," Harding said. "I went out too fast. I ran a 1:05 at the half mark, but I struggled toward the end. I ended with a 2:20 and to this day wonder what would have happened if I did it differently. "I had a talk with Bill Rodgers (the legendary winner of four Boston Marathons) and he told me I did the right thing by going out fast. He made me feel better." Harding's fastest marathon time is 2:18, and he did his best half marathon in 1:05. All the ups and downs of a long running career have only made Harding stronger and more than willing to keep lacing up his running shoes for the Westport Summer Series -- he loves the low-key atmosphere of the series -- and his annual meeting in June with the finish line at Jennings Beach. "You have to get there early," Harding said of the Fairfield half. "You might want to park a little bit further away, too, or you will be stuck there for a while. You also have to make sure you drink a lot, it can be a real hot time of year."